Below is the latest batch of black panther sightings reported to me by readers. As always, I can't verify the veracity of each claim but I present them here as anecdotal evidence that something is out there matching the description of what are commonly called black panthers. Most of the reports continue to come in the form of comments to posts about the subject. I would remind those who want to make a report, or discuss anything with me, that I am unable to reply to a comment. If you are wanting me to reply directly to you, which I will be glad to do, you will need to send me an email. The address is Texascryptidhunter@yahoo.com. I'll get back to you as soon as I can. Now, on to the latest reports. "I saw a large black cat within 20 yards of my car sitting in the middle of our dirt road in Grimes County the day before Thanksgiving. Yesterday a large deer was hung in our fence. We cut her out but she had a badly broken leg and we had to shoot her. Went back this afternoon to drag her off into the woods. Saw hugh cat prints and found her about 25 yards away........ only bones left....... Weird. Should we contact the Parks and Wildlife Dept?" "Back in late November 2011 I was able to get a picture of the head of a black panther on my game camera.This animal has been hanging around here for several years. We live in the Cass County area just southeast of Atlanta,Texas. Everyone I have shown the picture to says it is a black panther,You be the judge." "Outside Quitman Texas, Have seen Paw prints and steaming feces in a pine thicket in a moist sand spot in a gas line right away and feces were on top of the track.Dogs and cats have vanished and found a colt head in woods covered by leaves and dirt. Ask cousin if anybody had lost a colt lately he said no.They have seen black cats on several occasions and I found a tree stripped of bark ,it wasn't done by a deer in rut.Had a strange experience in that area on deer hunt about 8:30 in morning.Slight southerly breeze. Something came over hill and down the gully where a tree had fallen on the fence.I was sitting in a tree over looking a sandy about 50 yards away road crossing and never got to see it.Every bird type in area was concentrated in this area following what ever it was. It was so loud you could not hear and they weren't afraid of me as they landed all around me and on my gun barrel. 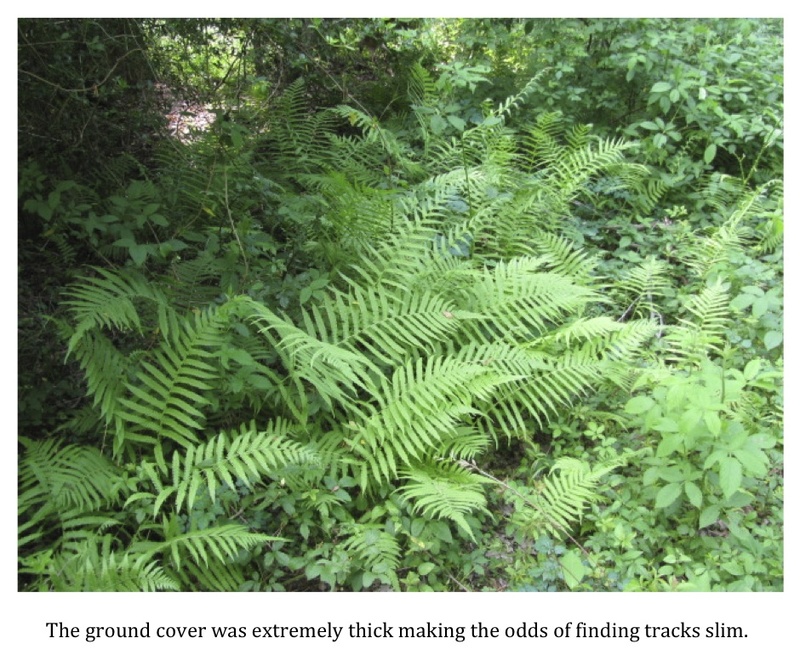 Looked for tracks on road but found none,checked creek crossing found smudges going up bank." "My wife has seen a black panther twice in our back yard in liberty county, TX." "Starting late last year a good friend of mine has been seeing a large brown cat with long tail on his property in Pittsburgh, TX. Just a couple of months ago mid february their 110 lb. black lab\rotty mix (a real homebody layabout) disappeared. They fear he was killed by the cat, and have since spotted the animal 2 more times." "Me and my wife have lived on the outer most western suburb of Fort Worth, Tx and a couple of years ago we had about three sightings of a mountain lion sized black cat. Any thoughts?" As always, my thanks go out to those who have sent in reports. Again, if you would like to discuss what you saw or even have me come out and take a look around the sighting location and/or possibly put up some cameras send me an email. Kathy Holcomb, if you are out there reading this I would love to see that picture you mentioned in your comment. You can email it to me at the address mentioned above. I have a lot of friends who are wildlife biologists who would like nothing better than to prove black panthers exist. I won't post the photo without your permission. Keep the reports coming folks. Sooner or later we are going to get one of these cryptid cats on video or a photo. The Utah County Sheriff’s Office is reporting a scary incident that took place on forestland about 50 miles south of Salt Lake City. It seems two booby traps were found off a popular hiking trail that were more than capable of killing any unsuspecting hiker that might have been unfortunate enough to come across them. 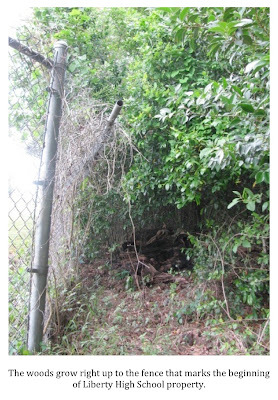 One trap featured a ground wire that, if tripped, would have sent a 20-lb. boulder, outfitted with multiple foot-long wooden spikes, swinging at approximately head level across the trail. Picture a 20-lb. sea urchin whacking into your skull at high velocity and you get the general idea. The other trap was designed to trip a hiker into a bed of wooden stakes. As mentioned above, the two traps were more than capable of inflicting fatal injuries to passers-by. Sgt. Spencer Cannon of the Utah County Sheriff’s Department said that two men had been arrested and charged with “suspicion of misdemeanor reckless endangerment.” The men claimed that the traps were intended for wildlife but authorities are not buying that story. The actual location of the traps was not given in the article I came across. It is merely stated that the traps were located by a U.S. Forest Service officer who was out patrolling an area about 50 miles south of Salt Lake City. That being the case, I would guess the traps were located somewhere in the Wasatch National Forest. Below is the write-up of an investigation of an alleged sasquatch sighting that took place in Liberty County, Texas earlier this month. This report illustrates the importance of actually getting to a sighting location and meeting witnesses face to face. As stated in the report below, I initially had some concerns regarding some of the details the witness reported. Once I was able to visit the location of incident and walk through what happened with the witness the details he reported seemed plausible. I am a 56 year old of sound mind with many of those years spent hunting and exploring Liberty County and other East Texas woods and bottoms. I continue my passion of wilderness back-packing with recent trips to the toughest areas in Big Bend National Park and a solo backpack on the Eagle Rock Loop in Arkansas' Ouachitas (where I came face-to-face with a bear). I am cautious but composed when I get into the woods and not inclined to overreact to critical incidents in the wilds. The other night (Tuesday) while walking at an edge of Liberty that leads down toward uninhabited Trinity bottoms, I saw something. Disclaimer: although I did see something, I acknowledge that minds play tricks on perceptions and imaginations fill-in gaps around what eyes see and don't see. I have taken several days to soberly sift the conclusion that I will now share. At about 10:30 P.M. I was walking along an area on the edge of Liberty that leads down toward the Trinity bottoms. My mind was completely at ease and drifting around various projects, backpacking memories, and dreams of a purchasing a new gun. The night was clear and I was enjoying the moon and stars. I was carrying my trusty old golf club for safety. ALL OF A SUDDEN, a supercharged adrenaline rush focused all of my concentration on movement on my side of a tree located about 50 yards in front of me. You have experienced these moments - from day dreams to instantly tense, all-in fight-or-flight. In a fraction of a second my arms and hands began tingling, my ears rang with a TV static kind of sound, and my vision and hearing became sharply acute. Whether or not my perception is accurate, this instantaneous physiological rush was 100% real. It was a time-stands-still, brief loss of motor skills moment. My adrenaline focus involuntarily targeted a large (shoulder-high to the lower limbs of sizable trees) bi-pedal something walking deliberately around a tree and down toward the bottoms. The walk was upright but a little hunched from upper-mid-back up and the head was erect. Color: a burnished red-grey (more on the grey in a second). The walk was the swaying gait of a Star Wars wookie, but quite a bit less exaggerated with knees sightly bent. The swinging arc of the right arm was very visible (relative to my location, "it" was walking from left to right) and I saw that the arm-wrist-hand was somewhat longer than normal human proportions. "It" used its left hand to push aside a limb. "It" took a brief, glancing look at me and and moonlight (the center of the face was less hairy and seemed to be slightly more grey) made visible the standard eyes-nose-forehead-jaw features of a hairy face. This glance did not slow "its" motion, in fact the deliberate motion became more purposeful as it pushed around the tree and back into thicker trees. Note: this was a two or three second glimpse before the "it" disappeared into thicker trees and brush. My reaction was instant. I called my wife on my cell phone and told her that I saw something and that I was getting the heck out out of there fast. Instead of following the trail (it would have taken me nearer to the location of the glimpse) I tore straight through from where I stood to a gate out of the area and closer to more developed Liberty. 10:30 pm - The sky was not perfectly clear, but there was enough moon to see. Note: at this end of the track, the school's lighting has only a little effect and is not strong. 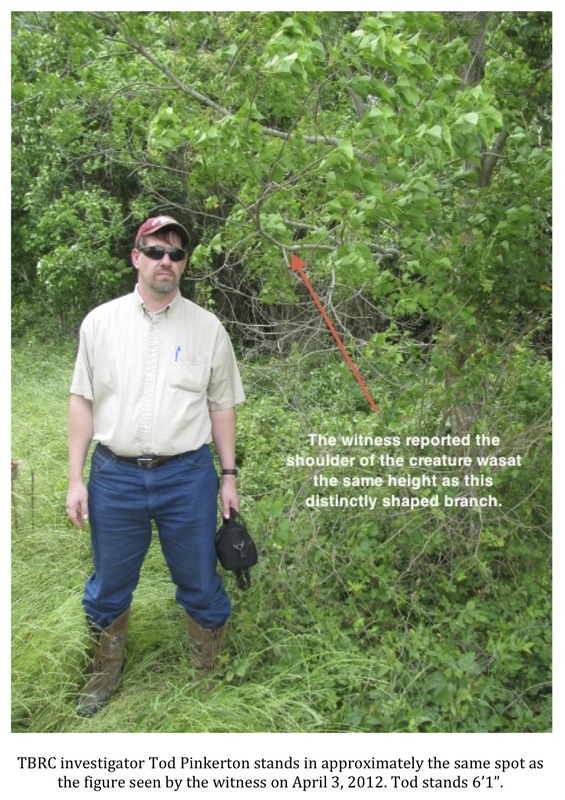 This interview was conducted as a result of an alleged sighting of a large upright biped that matches the description of a wood ape in Liberty County, Texas on March 3, 2012. After an initial phone interview with the witness, fellow TBRC investigator Tod Pinkerton and I paid a visit to the witness in his hometown of Liberty, Texas. The witness was gracious, extremely cooperative, and visited the sighting location with us in order to walk us through the events of the evening of April 3rd. The witness described the subject as being very large and covered in hair of a reddish shade. The subject walked from the witnesses left to right around and in front of a very distinctive small tree before pushing a limb/some brush aside with a sweeping motion of its left arm and striding into the woods. The witness said as the subject walked in front of the tree it looked back over its shoulder and briefly locked eyes with him, which gave him a good, albeit brief, look at its face. The face was described as grayish and definitely lighter in color than the rest of the animal. The features were described as, “the standard eyes, nose, forehead, and jaw of a hairy face,” but no more detail could be discerned due to the distance, estimated at 50 yards, between the witness and the subject. Other details noted by the witness in regard to the subject were arms that seemed very long by human standards, a slightly stooped posture, an odd swaying gait, and immense size. The witness could not recall hearing any unusual sounds and did not detect any type of odor before, during, or after his visual. The witness was quite unnerved by this encounter and immediately returned to his vehicle and left. He did not continue around the curve of the track, which would have brought him closer to the spot where he had seen the subject, but cut right down the middle of the football practice field in order to exit. The witness told only his wife and his closest friend of the incident. He revisited the site the next day with his good friend and looked for trace evidence of the subject without success. The witness did show the friend the small tree that the subject had stood next to and walked in front of which has a very distinct limb that grows nearly parallel to the ground. The witness estimated the shoulder of the subject was at the height of this limb which allowed him to estimate its height at seven feet. His friend, like the witness, is no stranger to the outdoors and was open to the possibility that a sasquatch had been seen. “What else could it have been?” was his statement to the witness after hearing the account and looking over the area. Fellow TBRC investigator Tod Pinkerton and I met the witness at the sighting location at 2:30 P.M. on Sunday, April 15th, 2012. The witness walked us to the spot on the track where he first sighted the subject. We then circumvented the chain-link fence that separates the track from the wooded area and began to look around. The wooded area lies just northeast of the track while the area due north is more open. The woods here were surprisingly thick and inhospitable. Thorns and briars were prevalent, making walking in the area difficult in many areas. Having said that, several game trails wound through the woods and it was clear the area was rich in wildlife. I walked ahead of Pinkerton and the witness and spotted three white-tailed deer within moments of entering the woods. Hog sign was also present. 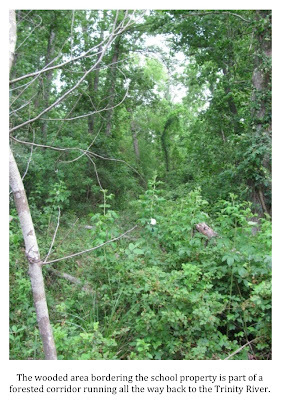 This was a true, hardwood-bottom type area; there was not a pine tree to be found. 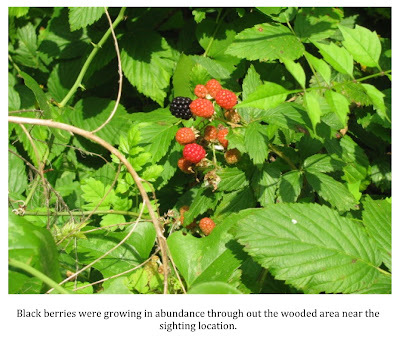 Black berries were growing in abundance and many were ripe already. I admit to helping myself to a few during the investigation. At 15 to 20 yards into the woods, there was, surprisingly, absolutely no sign that humans used this area. I did not see any beer cans, coke bottles, empty cigarette cartons, spent shells, or fast-food bags. Several hundred yards into the woods I found some debris, but it had clearly washed in during a high water event sometime in the past. Pinkerton and I agreed that it did not look as if anyone had been in the area recently. The floor of the forest floor was covered in thick leaf litter and we could not locate any spoor that might indicate the presence of any wildlife beyond known indigenous species of wildlife. 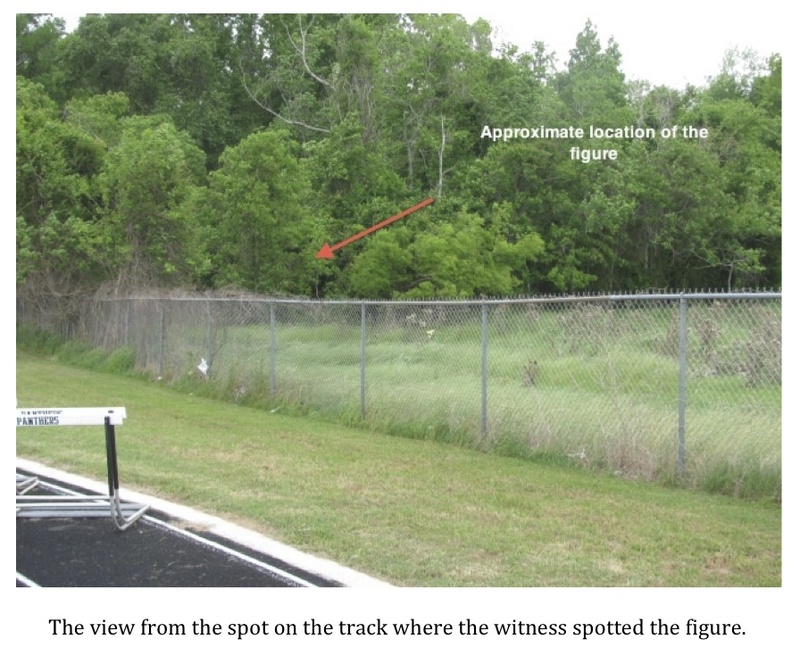 The area where the witness spotted the subject was just south of a spot where a game trail “exited” into the more open grassy area. Anyone or anything situated here would have had a good view of any deer or hogs, which the witness claimed to see in the open area, almost every time he has walked at night, coming out into the open field from the bottoms. The spot also provided a clear view of the high school track. I will admit to having had some initial concerns regarding this report. Foremost among them was the amount of detail the witness was able to describe despite ostensibly seeing the subject at a distance of 50 yards at 10:30 P.M. Moreover, the location is practically in downtown Liberty. Main Street is literally only one-quarter of a mile away from the sighting location. In addition, the proximity to the high school left open the possibility that the witness had seen a young person out getting into mischief. I can say that my concerns faded upon meeting the witness and conducting an on-site investigation. The witness was fully cooperative and more than open to sharing the details of his encounter. He is a prominent citizen in the community and has no reason to lie about what he saw. In fact, if his identity were to be released it could potentially harm his career. He could not say for sure he saw a wood ape but he believed without doubt that what he saw was not some sort of “hobo,” homeless person, or derelict; he was certain it was not any other kind of animal. “What else does that leave?” he asked. The proximity of the sighting location to town became less of a concern to me upon closer inspection of satellite images of the area. There is a riparian green belt that parallels a levy that runs from town all the way east to the Trinity River. It is not implausible to think that an animal could have traveled this corridor and found itself near town without being spotted. Deer and hogs were certainly present and frequent the area with regularity. Why not something else? My main concern was just how much the witness was able to see from 50 yards at 10:30 at night. When we recreated the details of the sighting, placing the witness where he had stood that night and placing investigator Tod Pinkerton in the approximate spot where the subject was first seen, we discovered the distance was, in fact, only 26 yards. I tend to believe that it is a strong possibility that the subject was a bit further out of the tree line and closer to the witness than he estimated. It is possible the witness and the subject were as close as 20 to 22 yards apart. The moon that night was a waxing gibbous that was 87 percent illuminated. The fact that the witness and the subject were actually much closer in proximity than originally estimated on a very bright night makes the amount of detail reported by the witness much more plausible. Finally, the fact that no sign of a regular human presence was found in the densely wooded area, along with the extreme difficulty anyone in an ape costume would have had navigating at night through that dense vegetation, with its copious vines, thorns, blackberries, trees, and branches, made it seem highly unlikely that some mischievous high school delinquent in a gorilla suit was out pulling a prank. Pinkerton and I both reached the conclusion that the witness saw something for which he could not account. Neither of us detected any signs of deception on the part of the witness and came away confident that he believes he saw a sasquatch that night. The description of a bipedal, hirsute animal would seem to eliminate the possibility that any of the area’s known wildlife was seen and misidentified. The TBRC continues to collect and investigate reports of encounters—both contemporary and historical—with strange, bipedal ape-like creatures in Liberty County and surrounding Big Thicket Counties. This part of southeast Texas continues to make up the most prolific region in the four-state area for reports of encounters with creatures fitting the traditional description of the sasquatch, or wood ape. *To see all the photos taken during the course of this investigation please visit the Texas Cryptid Hunter Facebook site. Just hit the Facebook link in the right margin and go to the 'photos' section on the home page. Sasquatch FAQ: What is Bigfoot? What is bigfoot? It is one of the most frequently asked question out there when it comes to topic of the sasquatch. The debate on just exactly what this creature might be is currently raging with white-hot intensity within the small niche of society interested in such things. Is it an ape? Might it be some sort of primitive human? A spiritual being of some sort? Nothing more than a myth? What is it? Most people who believe the species actually exists fall into one of two camps. They either think the sasquatch is an ape of some sort or a primitive human. For now, let’s forget about from what, or whom, if you prefer, this creature descended. Gigantopithicus blackii? Homo erectus? Homo heidelbergensis? Neanderthals? All questions for another day. For now, let’s simply concentrate on the much broader issue of whether the sasquatch is some sort of ape or primitive human. Before we get too deep we will have to answer what seems like a simple question. What exactly is it that makes us human? The answer to this question is not nearly as simple as you might initially believe. Live Science recently published a brief list entitled The Top 10 Things That Make Humans Special that might help us with this question. The list includes the use of speech, nakedness, extraordinary brains, use of clothing, and the mastery of fire as being defining characteristics of humans. Let’s start with these points and take them one at a time. The ability of humans to speak and use language is due in part to physiology. The larynx sits lower in the throat of humans than it does in the great apes. Humans also possess a descended hyoid bone, a horseshoe-shaped bone, below the tongue, which is not attached to any other bones. This allows humans to articulate a wide variety of sounds, which, in turn, allows us to form words. The ability to articulate many words led to the development of language. To say there is no evidence at all that the sasquatch might have some sort of rudimentary building blocks of language might not be completely accurate. The TBRC captured some very intriguing audio last summer during Operation Endurance. While the audio is quite unlike anything I’ve ever heard it does not suggest true language to me. I’ve never heard any credible, and that is the key term here, accounts of sasquatches “speaking.” Communicating? Yes. Speaking? No. The ability to communicate via a true language is something that, so far as we know, only humans do. Nakedness refers to the seeming absence of hair, at least compared to our great ape cousins, on humans. Our “nakedness” makes us truly unique in the animal kingdom. We don’t have a thick coat of hair or fur and also lack feathers and/or scales. We are quite different in appearance from everything else out there. The truth is that, on average, a square inch of human skin contains just as many hair-producing follicles as other primates – sometimes more. The difference is that our hair is pretty puny. It is significantly thinner, shorter, and lighter than the hairs found on our great ape cousins whose coats are made up of much sturdier stuff. This “nakedness” is an undeniably unique characteristic of humans. Another characteristic that separates humans from all other species is their truly extraordinary brain. This characteristic, more than any other, puts up a clear barrier between humans and the rest of the animal kingdom. Our brain only weighs in at about 3 lbs. when fully mature. On average that is only about 2-3% of an adult human’s body weight. Yet this incredible organ provides us with the ability to reason, compose music, think in the abstract, understand and use mathematics, comprehend cause and effect, anticipate outcomes, and literally thousands upon thousands of other things. There are numerous other species out there that are incredibly intelligent. Dolphins, pigs, the great apes, and others fit this bill but humans are the undisputed intelligence champions of the planet. Our brain clearly makes us different than any other species. Humans make and wear clothing. Animals do not. Period. This is one point that really is just that simple. The nakedness of humans has already been addressed. The lack of a warm coat of hair or fur made the development of clothing and absolute necessity if the species were to spread and survive in many regions of the planet. It is true that some tribes living in equatorial regions wear little to no clothing. The need for it just isn’t there. However, I would point out that these tribes do “accessorize,” if you will. They adorn themselves with necklaces, bracelets, anklets, ear and nose rings. I would argue these decorative adornments fall under the same general umbrella as clothing. Animals do not adorn themselves in these ways. No animal, even in temperate regions where humans have to clothe themselves in order to survive, fashions and wears clothing or other adornments. It simply does not happen. Only humans wear clothes and/or adornments. Among all the species on this earth, only humans have the ability to use and control fire. The mastery of fire, in my opinion, helped our unique and powerful brains develop. Once humans controlled fire, predators could be kept at bay and the night was no longer a time to cower in fear simply waiting for the sun to rise. This meant something new occurred: leisure time. Without the fear of being attacked in the night, humans had the opportunity to sit and ponder the many mysteries of this world, star gaze, and dream up new and increasingly fantastic inventions. Fire also kept humans warm and allowed them to populate colder climates. In addition, fire gave humans the ability to cook food. Many scientists feel that this ability to cook food directly influenced human evolution and appearance. Since cooked food is easier to eat and process, over time, tooth and gut sizes in humans were reduced. Truly, the mastery of fire is one of the most significant differences between humans and any other animal. As you can see, the characteristics noted above seem to clearly separate the human from the sasquatch. To be fair, the Live Science list does include some characteristics that the sasquatch is reported to share with people. Upright posture/ bipedalism, and hands with an opposable thumb, for example. These two shared characteristics might give one pause when considering whether the sasquatch is an ape or a human; however, one of these two “shared” traits really isn’t shared too closely at all. You might be surprised to learn that humans are not the only animals to possess opposable thumbs. Most of the primates do, as a matter of fact. The important difference is that humans have the ability to bring their thumbs all the way across the hand to the ring and little fingers. Humans can also flex the ring and little fingers toward the base of the thumb. This ability is unique to humans and gives us a powerful grip and an exceptional amount of dexterity with which we can hold and manipulate tools and other objects. Of everything on this particular list, only the upright posture and bipedal method of locomotion is shared between humans and the sasquatch. “We also possess a curious ability to record abstract thoughts using a complex series of written, carved, or pressed symbols. Using this form of permanently recorded communication, a human being who lived hundreds or even thousands of years ago can pass along his or her thoughts to those of us who now live in the twenty-first century. I can honestly say that, while I’ve seen, heard, and smelled some very strange things during my time searching for evidence that would prove the sasquatch exists, I’ve never, ever come across anything that would lead me to the conclusion that they are some sort of primitive human. Not once. Neither have I experienced anything, or had a witness report to me, any observed behavior or characteristic of a more esoteric nature. While no one can say with any degree of certainty as to what these creatures are, and be very wary of anyone who claims they can, I feel strongly that they are animals and not some kind of forest person. The one characteristic they seem to fully share with us, upright posture/bipedal locomotion, is not enough to convince me they are anything other than animals. I think that is dead on. An Ocelot or a Bobcat? A couple of months ago a reader contacted me regarding a picture of a spectacularly marked cat that had been photographed by a game camera near Valley Mills, Texas. 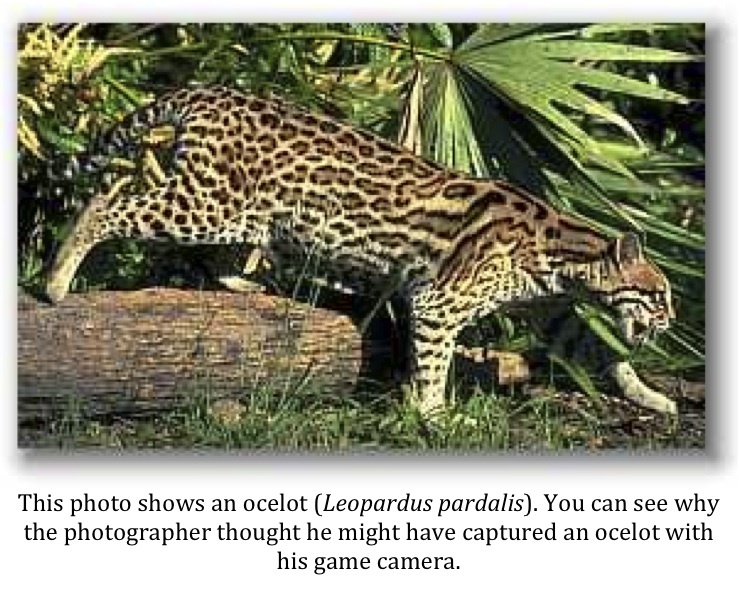 The photo had been captured by a friend of this reader who thought the image might be that of an ocelot. I guess I don’t have to tell anyone reading this post that I live for this sort of thing and asked if he might email me the picture. 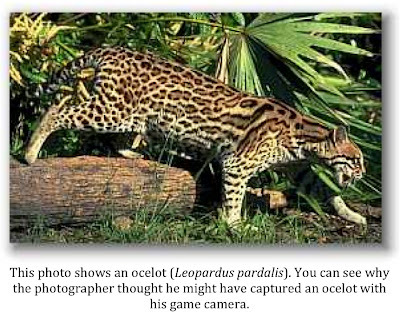 When I first opened up the file and viewed the photo I, just for a second, thought it might indeed show an ocelot. 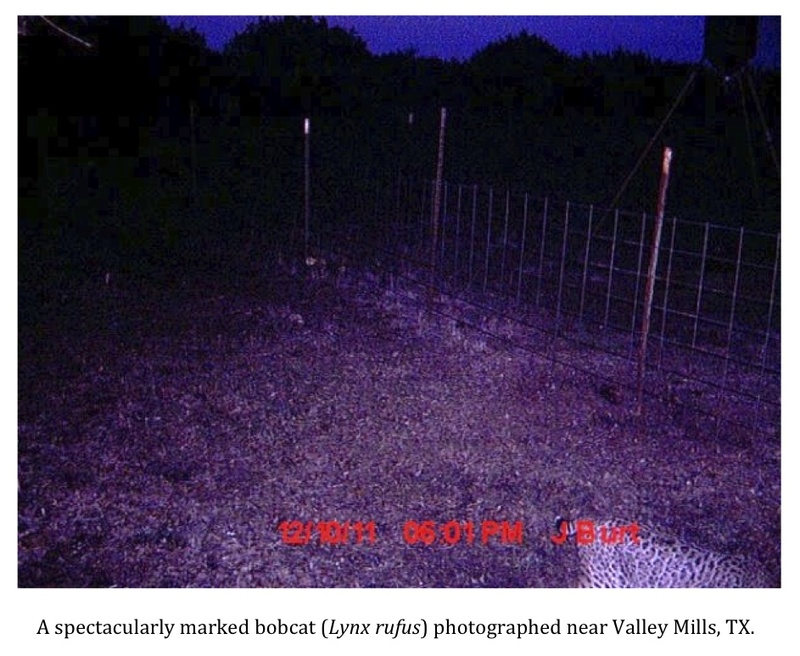 Upon closer inspection, however, it was obvious the photo showed a bobcat. While the head of the cat is not visible in the photo, the short tail gives away the identity of the cat. Don’t get the idea that I was disappointed. While a photo of an ocelot would have been spectacular, I get a kick out of all pictures of big cats. This bobcat is absolutely gorgeous. It is downright “leopard-like” in appearance and anyone catching just a glimpse of it could certainly be excused for thinking they might have seen something more exotic. A great many people assume bobcats are all a bluish-gray color. This is just not the case, at least not here in Central Texas. If you have followed this blog of late you know that I’ve captured some photos of similarly marked cats. Our population in this part of the state is anything but dull in appearance. Bobcats may be the most common wild cat left in the Lone Star State but they are truly something to see. I’d encourage all of you out there to invest in a game camera. They come in all price ranges and have actually become very affordable. Put one out overlooking your pond, pasture, or even a bird feeder. You’ll have a lot of fun looking over all the photos you capture. You just never know what you might see.